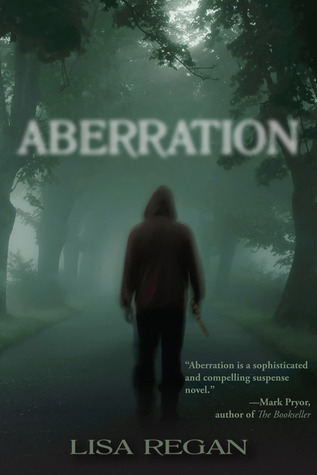 Back around January, I was approached by the lovely Lisa Regan to read an ARC of her second novel, Aberration, which has now been released. I hadn't yet read her debut, Finding Claire Fletcher, but having read so many amazing things about it I jumped at the chance, and I thank her profusely for the opportunity. I quickly devoured Finding Claire Fletcher, and when Aberration arrived, I tore through it in two days (a record, if you know how slow I normally am!) I highly recommend picking up both these books, Lisa writes thrilling crime fiction with a unique twist. When a series of sadistic murders bearing the same signature arise in different parts of the country, FBI analyst Kassidy Bishop is assigned to the “For You” killer’s task force—whose investigation leads right back to her. The homicides are both calculated and savage, occurring in different states, but bearing the same signature: the words “for you” scribbled at each crime scene. The case chills Kassidy, bringing back memories of her own encounter with a violent criminal five years earlier. The stakes rise when the task force links the killer’s signature to Kassidy. As more and more bodies turn up, Kassidy must delve into her past and the mysterious death of her twin sister, which holds the key to uncovering the killer’s identity. This second outing from crime writer Lisa Regan cements her status as one of the most promising talents in the field. If you've read her first novel, Finding Claire Fletcher, that delicious sense of creeping menace is still present, along with a greater depth and complexity. A serial killer is taking out his victims in a variety of perverted ways and leaving the words "For You" at each scene. We know from the start whodunnit (as we witness the murders from the POV of the perpetrator, and the matter-of-fact description here is quite disarming). The question is why, and for who? Regan dripfeeds backstory about the killer, and the investigating agent, Kassidy Bishop, judiciously, making you want to discover more and more. I was also impressed by the meticulous research that was in evidence, regarding the FBI, and the behaviour of stalkers and psychopaths. It reads like a novel by a seasoned thriller writer. And if you want twists, you surely won't be disappointed - in fact, I want to reread the whole book in the light of what we find out by the end. The pacing is excellent - well measured, and not frantic and headlong. Again, this is effective in the way it helps build the tension and danger. Superb! I eagerly await further works from Lisa Regan. Oh, and we've also had this new addition to the family... the gorgeous Pippa. Though really, she's no trouble at all! This is an old pic - she was bigger than that when we got her, but it's so cute I had to share it! Lisa will be excited to see your review! I still have to read her first book. Pippa looks like a troublemaker. One that you can't say no to. Good to hear from you, Nick! Nice review. I'm looking forward to getting my hands on this one. Happy to help in any way I can with your announcement/s when you're ready. Great review! Although I don't read much crime fiction, I can't help but be intrigued by this book. Also, no worries about being AWOL. We all have to go on hiatus at some point, for one reason or another! And aww, Pippa is such a cutie. Congrats on the new addition to your family! Awesome review. I'll put it on my TBR list. Thanks Nick. AWWWW!!!!! You are the best! Thank you so much. I'm so happy--and relieved--that you enjoyed them both, especially Aberration because I was very nervous about it. Thank you for the amazing review. I really appreciate it. Good to have you back, Nick. Pippa looks like a bundle of fun and energy. Thanks for the book review. I love adding books to my TBR pile. Great review... books sounds good:) Will have to check it out. Awesome review! I'll have to add it to my TBR list. And glad to see you still around. Pippa is adorable! Lisa's book sounds good. I will add it to my TBR pile. Intense book:) Must require lots of research to put it together, which is no small task. Pippa is adorable! I have Lisa's first book on my Kindle, and I'm looking forward to reading it. I'm sooooo behind. I read Aberration last weekend and couldn't agree more with your review. Lisa is fantastic. Your new addition to the family is very cute. Looking forward to hearing more about your new venture, sounds exciting. This sounds like a great read. I like these types of stories. Great review, Nick. Sorry about the job issue, but it sounds like you're taking some steps to remedy that. Congrats on your new family member. stellar review! i hope they make a movie out of one of her books! and what a cutie pie pup! Your review definitely makes it sound like a great mix of creepy suspenseful action! Love the pic of Pippa. wow! sounds like a great story. I do enjoy a good thriller every now and then. Great review. Sounds like an awesome read. Sounds like a very interesting book! Pippa looks so cute. I received my copy of Aberration last Thursday so I'm glad to read a positive review. Best of luck with your upcoming editing service Nick and thanks for stopping by my blog today and your great words about Shannon's cover. Sounds interesting, will have to check that book out. Awww... Pippa is cute. I'm usually lazy with reviewing-- yours seems pretty balanced. Will look out for this book. Thanks for the review. It sounds like a very suspenseful book. First review I've seen of her book. Great review. I believe I have it in line to be read. The novel aberration sounds gripping though rather gruesome too. Sounds like a great read. Thanks for the review! I have Lisa's first book on my Kindle, waiting to be read. Aberration sounds good!